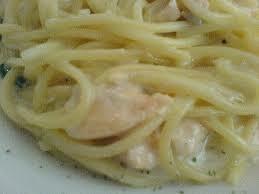 White creamy sauce for pastas. In small sauce pan, add soy milk, grate the peeled potato into soy milk, add salt and pepper, heat on low flame and whisk frequently until milk begins to thicken. Remove from heat and set aside. Add your favorites like garlic and spices.